Many European paintings are painted on solid wooden panels or boards, typically oak for Netherlandish paintings. The wood is usually split radially so that, in ideal circumstances, a sequence of annual growth-rings from pith to sapwood is present. These sequences are then matched one against another by the dendrochronologist and compared with growth sequences whose dates are known from living trees. Absolute dates can thus be assigned to specific annual rings. Sometimes the geographic origin of a board can be determined as well. Oak is not only the most common support for European panel paintings but is also the most easily dated because of the sheer number (now in the thousands) of oak panels and oak timbers which have been studied. Paintings also appear, but less commonly, on panels cut from beech, lime, fir, pine, spruce, poplar, and other species. These, too, can sometimes be dated with the exception of poplar which tends to have enormous and complacent rings. 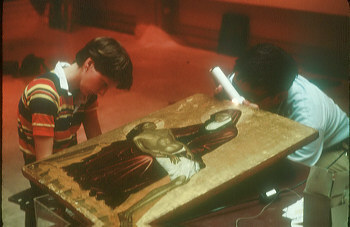 For example, the so-called 'Mellon Madonnas' in the National Gallery of Art in Washington, DC, are painted on poplar panels, each ring of which is about an inch wide. Thus the total ring count for each panel is about two dozen rings, all the same size, and the paintings cannot be dendrochronologically dated. Since many Italian paintings are painted on poplar panels, dendrochronology is perhaps not the best analytical technique for art works south of the Alps. North of the Alps and in the Low Countries in particular (as well as in Greece where many icons are painted on oak) dendrochronology has proven to be an extraordinarily valuable tool. The mechanism which makes tree-ring dating possible is that trees growing in the same climatic region (Europe) or sub-regions (Eastern Europe vs. Western Europe) respond in a recognizably similar fashion to the same general climatic stimuli. These stimuli may be temperature or rainfall or some combination of the two. In trees from the Eastern Baltic to the English Channel and even across into Great Britain and Ireland, adverse growing conditions will produce narrow annual rings, while favorable growing conditions will produce wide rings (Baillie, 1983). The sequences of such changes over time are unique. Moreover, subtle variations of ring growth, specific to a particular region, sometimes allow the dendrochronologist to determine the precise geographical origin of a panel (Eckstein, Wazny, Bauch, and Klein, 1986). For example, it has been shown that a large number of oak panels now found in a wide variety of western art collections were cut from trees that grew in the Eastern Baltic (Eckstein, et al., 1986). The boards were shipped west from Gdansk (Danzig), bought on the Amsterdam and Rotterdam docks, and subsequently brought into the studios of western European artists whose names are household words today. Panels painted on by the same artist or workshop have even been identified sometimes as coming from the same tree (Eckstein and Bauch, 1974; Klein, 1994). One has a mental image of, say, Rembrandt making his way down to the dockyard or to the shop of a middleman, buying a wagonload of oak boards imported from Poland, and bringing them back to his studio. While he paints on panel A, panels B, C, and D from the same shipment lean against the wall of his atelier. Which panel was painted first and which second, however, is beyond the scope of dendrochronology. The artist's taste or practice must also be considered. If a given artist has all of his known oeuvre on oak, and if a painting attributable to him were to appear on a poplar or lime panel, the investigator might well ask why there has been a new choice of material for the support. A transverse surface must be prepared across the end-grain of the board which is usually not painted and is normally hidden by the frame. This surfacing is most easily done with a sharp razor blade or a bit of sand paper. The annual rings are counted and measured with a microscope to 1/100mm. Although early accounts of the dendrochronological analysis of panels show attempts at using a simple loupe or hand measuring lens with 1/10mm. resolution as in Figure 1, these have proven to be relatively unsatisfactory, and the use of a proper microscope is the only acceptable method. For example, the only painted panel I have ever tried to date, a Byzantine icon on juniper boards (Fig. 1), is a classic demonstration of how not to measure panels. An appropriate microscope was not available in the museum, and one of the two boards had as many as 238 rings, some so small that the resolution of the hand lens was not enough to permit me to take sufficiently sensitive measurements. I think one panel has a last ring from 1539, but I cannot tell the date of the second panel until I go back and remeasure the icon with a real microscope. These microscopic measurements are recorded and plotted on an x,y graph. This graph is then compared and matched with graphs from other panels and from living trees. 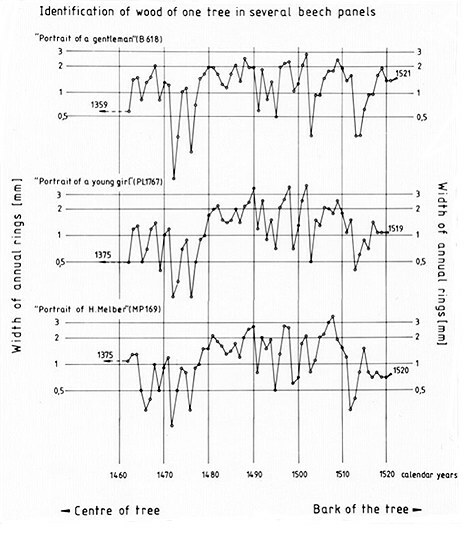 Figure 2 (not pictured yet) from top to bottom shows a cross-section of a ninth-century oak board, the graph of its measurements, and a comparable graph from another dated board from the same period. Note how the alternately large and small rings can be matched from one tree to another. These patterns or 'signatures' are unique in time. Statistical methods have been developed to test the probability of any proposed match. A recent, detailed exposition of the technique and its applications is by Schweingruber (1988). In order for the dendrochronological method to be applied successfully, several preconditions are necessary. The sample should preferably have at least 100 rings to prevent an apparently good but accidental and incorrect fit. The wood must have been cut radially (Fig. 3a). A panel cut in this manner not only provides a more stable surface for the painter but is less likely to warp and shrink than is wood cut tangentially to the ring-growth (Fig. 3b). The latter type of panel will usually not have enough rings to produce a sequence long enough for tree-ring dating. Obviously, the wood should be free of knots and other growth aberrations. Painters, at least those partial to oak panels, almost always are extremely particular in their selection of straight-grained, stable wood, and will avoid such blemishes in their choice of wood for the support. If all panels contained a complete ring sequence from pith to bark, dendrochronological analysis would be rather straightforward, but the quality of panels, like the quality of painters, is not equal. Since sapwood (roughly 15 to 30 exterior rings immediately under the bark for oaks) contains sugars which make it subject to insect infestation, the practice in the Middle Ages and Renaissance was to remove some or all of it before painting. This preparation can sometimes cause the loss of some heartwood as well. Because, in oak, the number of sapwood rings can be estimated to within a dozen rings (with regional variations--see below), the presence of a considerable number of sapwood rings in the panel permits greater precision in dating. When these exterior rings are missing from the panel, the dendrochronologist is forced to make estimates about the felling year. A panel can be all heartwood with an unknown number of heartwood rings on the recent end missing (Fig. 3c, worst case). It can have at the recent end the heartwood-sapwood boundary (Fig. 3d, better case). It can have a significant number of sapwood rings preserved (Fig. 3e, an even better case). Finally, it can preserve the terminal ring which grew during the year when the tree was cut down (Fig. 3f, the best case, but extremely rare). Only in this last case is the dendrochronologist able to say exactly in what year the tree was cut. For oak, various sapwood estimates exist, ranging from 32±9 rings for Northern Ireland (Baillie, 1982); 20±6 or 26±7.5 rings for Germany (Huber, 1967; Hollstein, 1980); 15 rings +9/-6 for the Baltic (Wazny, 1990); and 26±9 rings for the Aegean (Kuniholm and Striker, 1987). The most recent estimate for oak used by Peter Klein (1993) is 15 years +4/-2 for Baltic oak, and 17 years +6/-4 for western European oak. 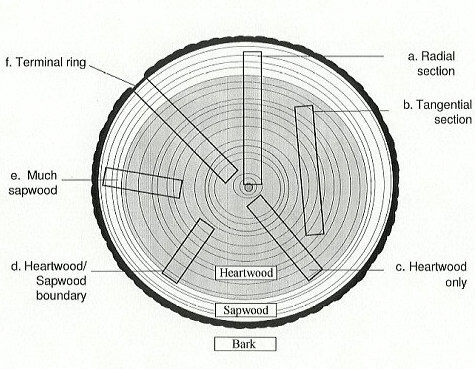 There is evidence that the sapwood ring-count varies according to the age of the tree[ 2]. For other species of trees this convenient sapwood estimation is not applicable. Some species (beech, for example) show little or no difference between heartwood and sapwood at all. Other species have wildly varying amounts of sapwood, and anything other than a terminus post quem date is impossible. Juniper, on which the icon in Figure 1 was painted, can have up to 160 sapwood rings. Another variable is how long the wood was seasoned and/or stored between cutting and painting. Paint will not adhere well to a wet surface, so a certain minimum amount of drying time is necessary before the ground is applied. Estimates based on a number of signed and dated paintings are 5±3 (=between two and eight) years for the drying-out period preparatory to the application of the ground and paint by painters of the Dutch and Flemish Schools of the 16th and 17th centuries (Bauch and Eckstein, 1970). The curing or drying-out period may vary from century to century or from artist to artist. Among the painters in the Cologne School of the 14th and 15th centuries a longer period of about 10 years seems to have been preferred (Klein, 1981). An artist may have chosen to paint on a panel that was cut and/or used many years--even centuries--earlier. If a dendrochronological date is far too early for the painter in question, other kinds of analysis such as x-radiography, etc., should be used to see whether there is any underpainting. 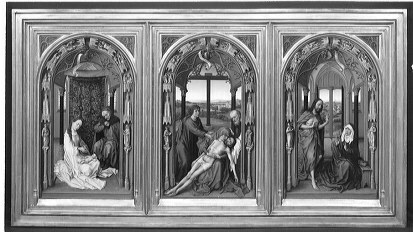 One of the greatest discrepancies between a dendrochronological date for a panel and the probable painting date by a well-known artist is over 150 years on the St. Anne altarpiece by Gérard David (and school) in the National Gallery of Art in Washington (cat. 1942.9.17.a-c), other panels of which were cut only 10-15 years before the painting's execution (P. Klein, pers. comm., and Klein's appendix to Hand and Wolff, 1986). This last case is extraordinary rather than the rule. Stretchers and frames represent a separate set of problems. Stretchers because of their shape often do not have enough rings to allow for dendrochronological dating. Frames can be older than, contemporary with, or later than the painting, and are probably best left out of any serious dendrochronological study. Finally, a particular panel might come from a tree with sufficiently erratic growth that it cannot be dated with confidence, no matter how many rings are present, or it could come from a tree growing in a sufficiently complacent environment (e.g., along a river bank with an unchanging amount of available moisture) that it does not match anything else. Peter Klein's comparison of three portraits by Lucas Cranach the Elder (Fig. 4) is an easy example. No sapwood estimations are involved since the panels are painted on beech whose heartwood and sapwood rings cannot be distinguished one from another. Figure 4a: Comparison of the growth-ring characteristics of three panels by Lucas Cranach the Elder (after P. Klein, 1986). Figure 4b: Comparison of growth ring characteristics of the three panels of Lucas Cranach the Elder shown above. We thank Dr. Klein and the respective museums for permission to use this illustration. Portraits 1 and 3, both signed, seem correctly dated, with a drying-out or storage time of 7 and 6 years respectively for their panels. The attribution on stylistic grounds of portrait 2 to 1520 which allows only 1 year between the last preserved ring and the date of painting should, at first glance, be reconsidered and the date moved--at least on normal dendrochronological grounds--to a slightly later time, especially since other panels from the same tree have now been found on which the 1522 ring is preserved! (P. Klein in C. Grimm, et al., 1994). Painting on this panel cannot possibly have taken place before 1523. A museum decides to sell a controversial painting, thought to be a Rembrandt self-portrait, in order to pay off its debts. Some Rembrandt specialists claim it is a "mature" portrait from very late in his career. Other specialists say it is only in the manner of Rembrandt but not by his own hand. You, the student dendrochronologist, are called in to help verify the date, and you find, correctly, that the last-preserved ring is 1652 when matched against the European oak chronology as a whole. One sapwood ring (1652) is present, so you apply Hollstein's German oak sapwood estimate of 26±7.5 years. You first estimate the cutting date as 1677 (1652+26/-1 because the 1652 ring is a sapwood ring). You modify the ±7.5 years to a round number: ±8 years. You therefore calculate a date for the cutting somewhere between 1667-1683. You add 5 years for the curing period, and you tell the museum that its panel was painted on somewhere between 1672-1688. Since Rembrandt died in 1669, the museum's painting is not an original but rather that of a copyist or follower of Rembrandt. This seems to clinch the argument about the date, and with great chagrin the museum sells the painting for a fraction of what it would have been worth were it a certifiable painting by Rembrandt himself. You accept a specialist's fee for providing this information, even though unwelcome, to the unhappy museum. Dendrochronology cannot tell us who painted the panel, or even when the panel was used, but under certain conditions it can tell us where the tree grew, approximately when the tree was cut, and when the prepared panel could have been ready for use. It also can tell us about the preferences of certain painters for their supports. If a painter paints only on oak panels, and suddenly a poplar panel appears, allegedly painted by him, one might have immediate grounds for suspicion as to the panel's authenticity.